Brian Francisco / The Journal Gazette U.S. Rep. Luke Messer, who seeks the Republican nomination for a Senate seat, gestures while speaking Saturday with former state lawmaker Jeff Espich during a campaign visit to New Haven. 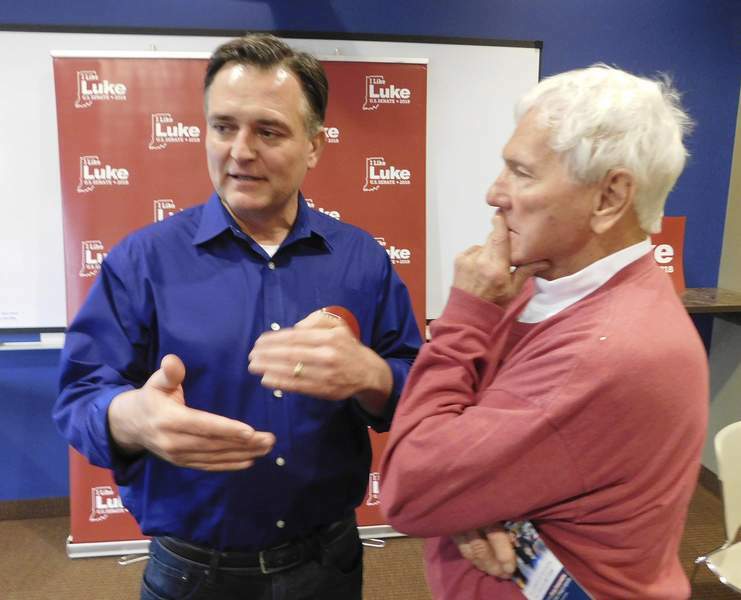 NEW HAVEN – U.S. Rep. Luke Messer said Saturday that truthfulness is the main difference between him and his two rivals for the Republican nomination for a Senate seat from Indiana. “I am who I say I am, and they’re not,” Messer, R-6th, said during a campaign appearance at the New Haven Community Center attended by about 30 people. “Look, if someone will lie to you about who they are in the middle of the campaign, then they will lie to you when they serve,” he said. “One guy is running around, throwing a hat on, and the reality is when it comes time for tough votes, he hasn’t been there,” Messer said in reference to U.S. Rep. Todd Rokita, R-4th. Rokita has often worn a cap displaying President Donald Trump’s slogan “Make America Great Again.” Messer and Rokita have nearly identical voting records as House members, but Rokita twice this year has voted against congressional spending bills signed later by Trump. “And the other guy, you know, could have addressed the fact that he was a lifetime Democrat who didn’t support Republicans ... and instead has just sort of tried to pretend that those things weren’t true,” Messer said about Mike Braun, owner of an automotive parts distribution company and a former state lawmaker from Jasper. The Associated Press reported in December that Braun had voted in Democratic primary elections from 1996 through 2008. Sen. Joe Donnelly, D-Ind., is widely regarded as among the most moderate Democrats in the Senate, along with Sens. Joe Manchin of West Virginia and Heidi Heitkamp of North Dakota. And just who is Messer? “I’m a person of faith, and I’m a pro-life, pro-Second Amendment conservative that supports the Trump agenda,” Messer told his New Haven audience. He said Trump “is under unfair withering criticism” from national media. Messer’s audience included New Haven Mayor Terry McDonald, state Rep. Dave Heine, R-New Haven, and former GOP state representative Jeff Espich of Uniondale. Polling firm Morning Consult reported recently that, during March, 48 percent of Indiana registered voters approved of Trump and 47 percent disapproved of him. The poll’s margin of error was 2 percentage points. Trump’s national approval rating was 41 percent last month. Messer also said Saturday that he supports the Trump-ordered missile strikes Friday against targets in Syria; letting military veterans receive their federally funded health care from private providers if they wish; and revising population-based federal funding formulas so that undocumented immigrants cannot be counted. Messer was scheduled to make other campaign appearances Saturday in Huntington, Auburn, Angola and Elkhart.